Picketing and strike signs appeared on campus for the first time this millennium as dining-hall workers sought a new contract. At a time of national concern about stagnating incomes, rising inequality, and middle-class malaise, the University confronted contentious issues with its lowest-paid workers throughout the autumn, yielding the first strike in more than three decades; a last-minute agreement with another union; and an unprecedented organizing election among graduate students and other teaching and research assistants. But both Harvard University Dining Services (HUDS) workers, represented by UNITED HERE Local 26, and custodians, represented by 32BJ SEIU (the Service Employees International Union), present a different employee profile. They are, in general, paid less than most HUCTW members, and even though their hourly wages and employee benefits are superior to those of many workers in comparable positions elsewhere, the HUDS staffers’ total earnings have been low because most union members have had regular work only when Harvard is in full session: typically, less than eight months per year. A $35,000 yearly income guarantee for full-time workers figured prominently in the dining workers’ negotiating position, along with the demand that their healthcare costs not increase. Harvard offered summer stipends of about $150 per week for workers with between five and 20 years of service at the University, and $250 per week for workers with more than 20 years; it also proposed the higher copayment schedule adopted by HUCTW (details appear at harvardmag.com/huds-strike-16 ). 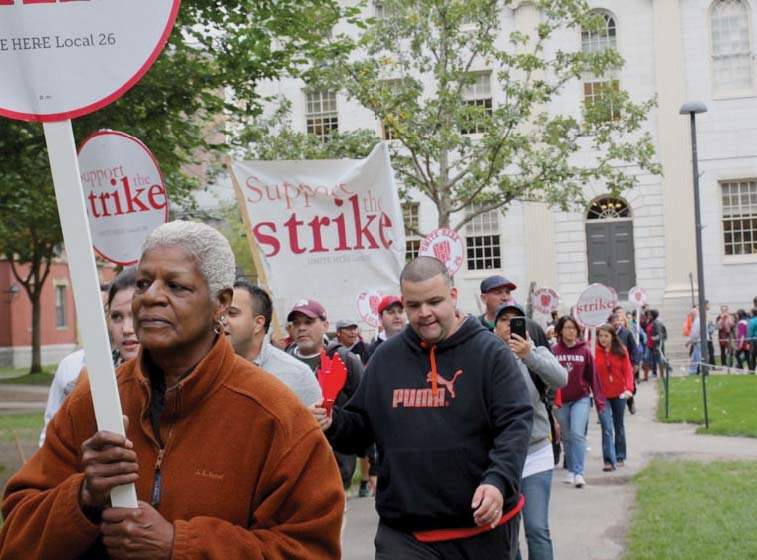 The union turned down those proposals, and after four months of negotiations, the workers went on strike October 5—the first strike at Harvard since 1983. During the next three weeks, striking workers paraded around campus, chanting and beating out rhythms on five-gallon buckets. They appeared to attract significant support from students, many of whom are friendly with the staff they see daily at meals. Most dining halls closed, but HUDS managers (and nonunion employees who were asked by their supervisors to pitch in) maintained operations at some facilities. Following a 22-day strike, negotiators reached agreement after a marathon bargaining session (accompanied by a large student sit-in at the building where the talks were conducted), and the workers voted 583-1 to approve a contract. It provides a $35,000 guaranteed income for those who work full time during the academic year, achieved by paying a stipend of $2,400 across 13 weeks, or about $185 per week (rising to $3,000, or about $231 per week, by 2020), with a prorated stipend for part-time workers. Wages will increase 2.5 percent annually for the five-year term of the agreement. And health coverage will remain unchanged for the next two years, and then will move toward higher copayments, but with part of workers’ added costs covered by a flexible spending account for each worker. Read a full report at harvardmag.com/hudscontract- 16 . Next up were the 700 custodians, who also appeared headed for a strike. But a middle-of-the-night settlement on November 16 averted another walkout. It calls for a 12.5 percent increase in wages across four years; because janitors earn slightly more per hour than dining-hall workers, and most of them work year-round rather than the seven and a half months per year typical for the latter, their financial situation is notably better. The typical custodian earns $22.07 per hour and $45,676 per year, according to the University; that hourly wage will increase to $24.67 by the end of the contract. About 30 percent of custodians work part-time; the contract, according to the union, “includes language to promote full-time work.” Workers will also have the option of joining a healthcare plan offered by SEIU without any monthly premiums, and with visits to certain doctors without a copayment. Harvard’s plan, which has monthly premiums and a broader network of doctors, will introduce in 2018 a sub-$55,000 premium tier, like the plans the University has introduced for other groups of employees. Read more at harvardmag.com/bjseiucontract- 16 . With those negotiations resolved, attention turned to the November 16-17 balloting, overseen by the National Labor Relations Board (NLRB), for possible union recognition for graduate-student teaching and research assistants (as well as undergraduates who perform paid teaching duties in classes like Computer Science 50). Harvard graduate students have been organizing for more than a year to form a labor union. They won the legal right to do so last summer, after the NLRB—unswayed by an amicus brief filed by the University urging a decision against student unionization—ruled that graduate students at private universities have the right to form labor unions (as reported at harvardmag.com/grad-unions-16 ). Student organizers reported in the spring that a majority of graduate students had signed authorization cards indicating their support for a union. But as the vote drew closer in the fall, a number of students publicly made the case against unionizing in op-eds in The Harvard Crimson and posters scattered throughout campus. Their arguments mirrored some of those used by University administrators: that a union could interfere with the academic relationship between students and professors, and that union dues might cost more than whatever benefits students gain through a union. About 1,000 of the roughly 3,500 ballots cast have been challenged due to questions about voter eligibility, significantly delaying the outcome of the vote. Some students remained confused about their eligibility even on the eve of voting. (Joshua Gilbert, a spokesman for the Harvard Graduate Student Union, said that students not yet engaged in teaching or paid research for Harvard—including many first- and second-year graduate students—were ineligible.) At press time, the results were still unknown. Much attention has been drawn to the ways in which universities mirror society’s broader inequities and economic anxieties. From the conditions of its lowest-paid blue-collar workers, to those of students training to become scholars and teachers, Harvard’s financial responsibilities to its community have become a subject for debate, too.